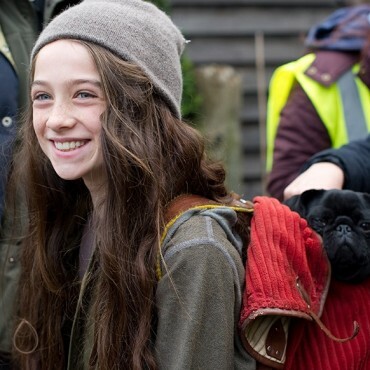 Raffey Cassidy wakes up bright and early to start filming. 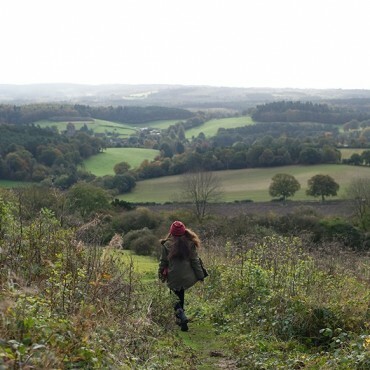 We filmed quite close to London but the feeling of the place was deepest countryside. The second green screen shoot day that we had was when Molly has a nightmare, well, a daymare really. Molly is dressed in a mop dress and rags and she tumbles down towards a plughole. 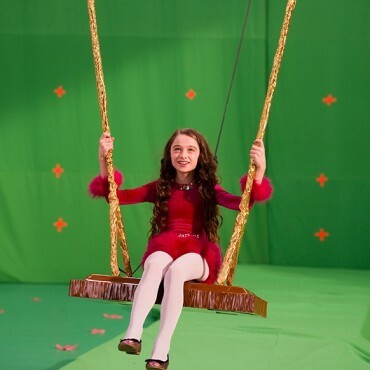 In this green screen scene, Molly's life feels like a nightmare. 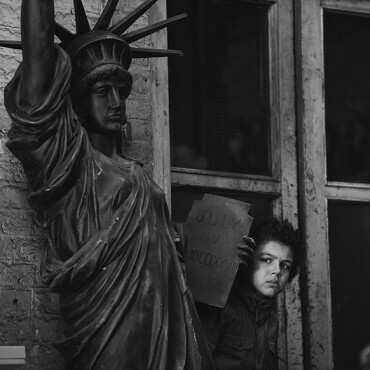 We never used the green screen footage as when we started to edit the film, the feeling was that these moments made the film too long and that the story didn’t need these parts. On the day we shot this part of the film there was a problem with food for the actors and crew. It was terrible because the caterers mucked things up and so there wasn’t any lunch and everyone was ravenous. A film crew really needs fuel. Luckily eventually pizza was ordered. And a new caterer employed. After that the food was great! 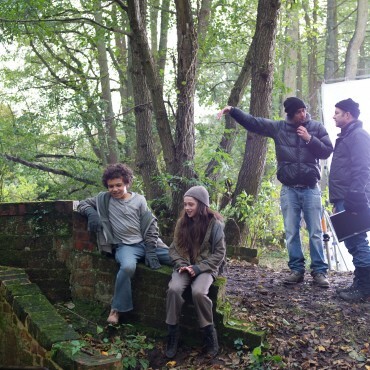 Jadon and Raffey relax as Chris talks to Dom about when the extras are going to jog past. There were two pugs used to play Petula. One was Lola who was good at performing. The other was this dog, George, who was calmer than Lola and very happy to sit in Raffey’s ruck sack! 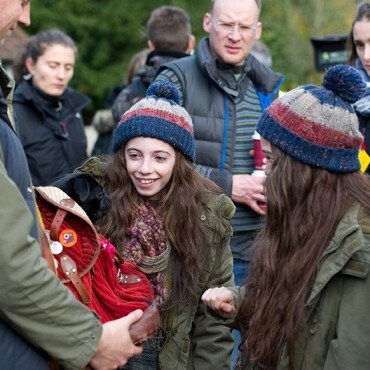 Raffey and one of her doubles, Olivia (the other was ….) are on set with Lola and the film crew. Olivia and … were brilliant. They were able to stand in for Raffey so that the camera people could do their job without Raffey actually having to be there. 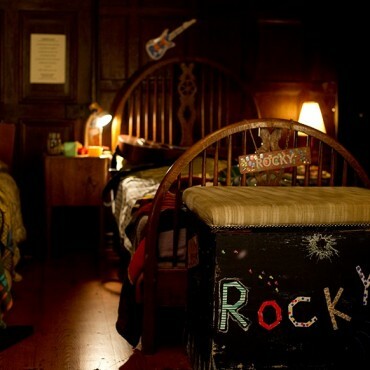 There are various shots in the film where Olivia or… are in the actual film instead of Raffey. These shots are always from behind. See if you can spot them! Petula in Molly’s ruck sack - always a cute thing to watch. 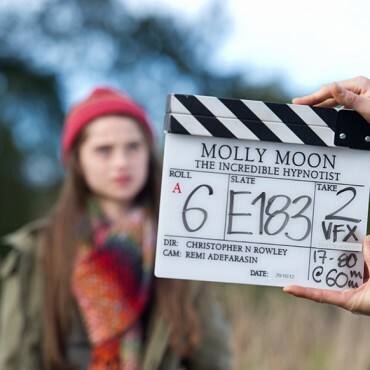 John Beard, Niamh Coulter and their set design department were amazing at creating Molly Moon’s world. 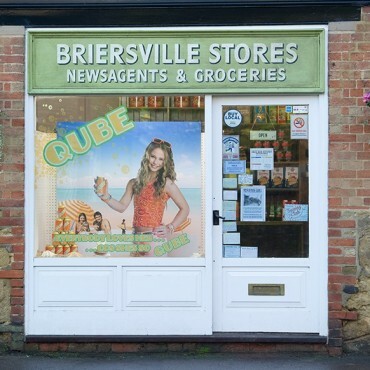 This is the Briersville stores. 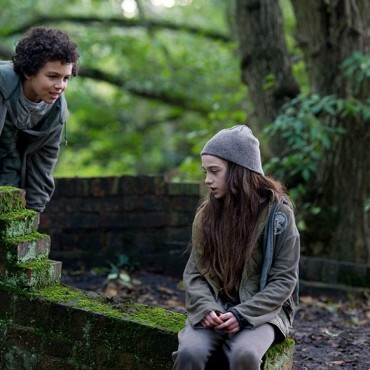 The child star Davina Nuttel advertises a can of QUBE. John and Niamh built this entrance to the Briersville Library, with ‘Knowledge is Power’ written over the top of it, in a gap between the buildings either side. Dominic Monaghan in the Briersville Library, getting into his part. 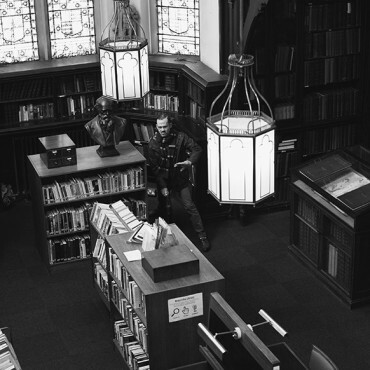 The location was a beautiful library in London. We were going to have a section at the end of the film where Molly runs through the crisp new snow… The feeling was supposed to be like the scene in the end of the book where Molly walks down a road that is fresh with new snow. The feeling was all about clean slates and new beginnings. We filmed it, but in the edit we realised that if we kept it in it just took up too much time at the end of the film, so we had to cut it out! 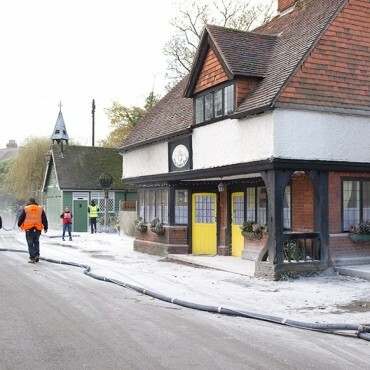 The crew blow snow into the high street of a village called Shere in Surrey, England, to make an autumn scene be a winter one. 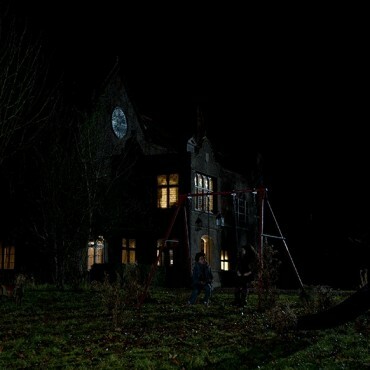 This is a night shot of the building used for Hardwick House. 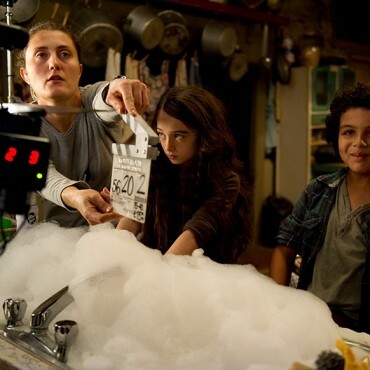 Raffey and Jaden are in the kitchen. 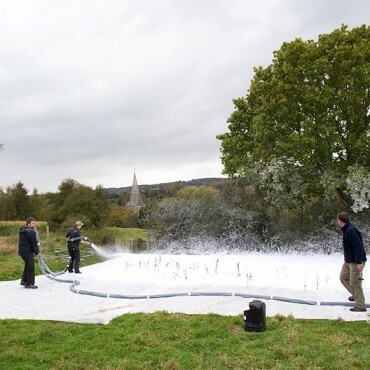 The washing up bubbles were very difficult to get going for this scene… There is a special recipe to make them stay bubbly that the set designers use! 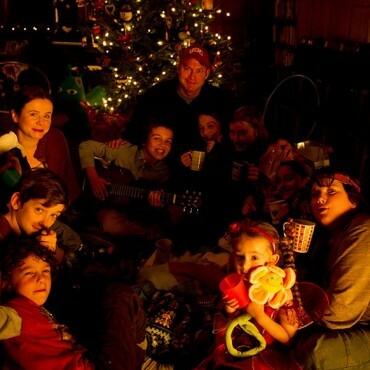 This is a picture of our brilliant cast all having fun on set, with the director, Christopher N. Rowley. 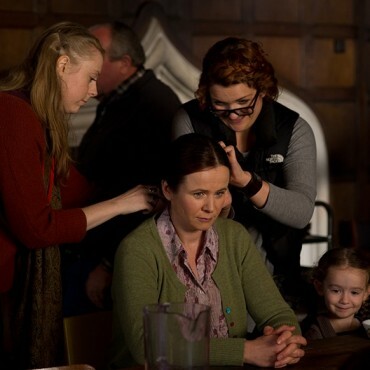 Emily Watson having her hair and makeup done. Dominic Monaghan having fun on set. The crew is busy getting ready for the next shot. 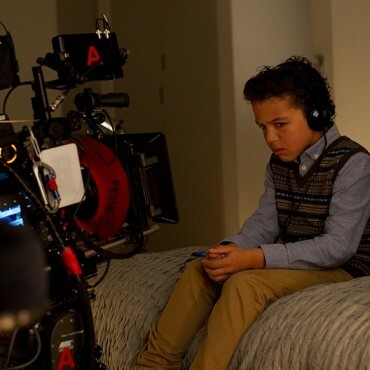 The director, Chris, talks to Jadon about how Rocky feels. 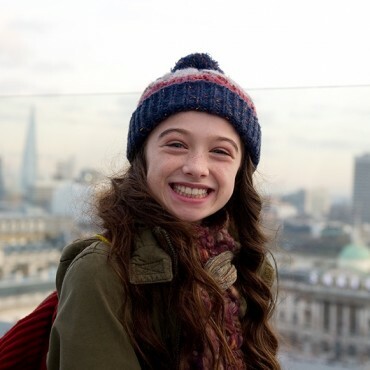 Raffey stands on the balcony of the Me Hotel with the London skyline in the background. The Shard is on the horizon. 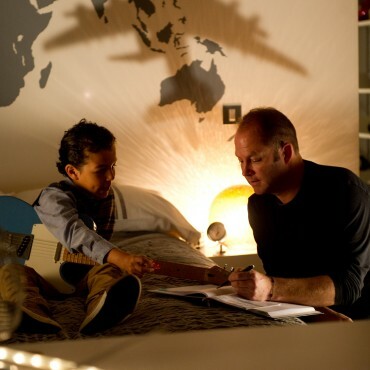 Raffey jumps around on the hotel bed for the scene where Molly has her first whole can of QUBE. 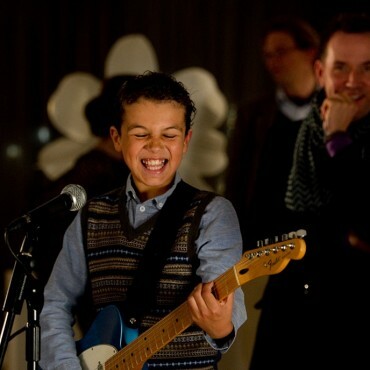 Jadon plays guitar for Ben Miller. Tallulah prepares to be the horrid spoilt diva, Davina Nuttel. Joan Collins and Gary Kemp sit on what is supposed to be the Fourth Plinth in Trafalgar Square. There is a blue screen behind them. 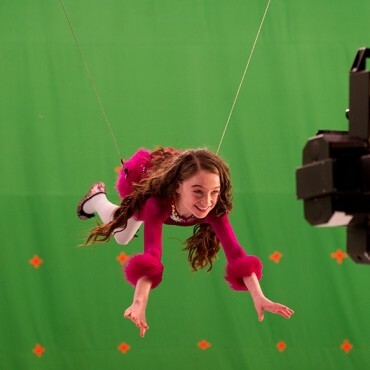 Like the green screen, this blue screen means that the visual effects people can add whatever you want to see. In this case sky and flying planes. Sitting on the back of the armored vehicle. Rocky hides in the warehouse.